Queen Elizabeth II is only the second monarch since Queen Victoria to reign for sixty years. 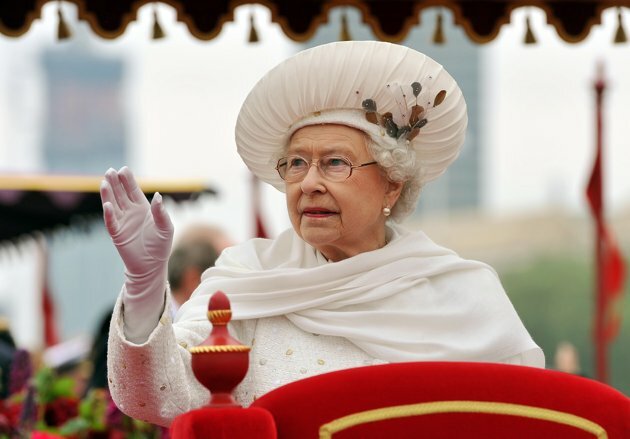 Last weekend, it was the Queen’s Diamond Jubilee celebration, where the British enjoyed four days of triumphant pageantry, horse-drawn carriages, royal barges, processions, church services, street parties, luncheons, concerts, festivities and general revelry. Naturally the Brits didn’t allow a bit of very British rain to stop the fun. We also celebrated here, in a more humble and low-key sort of way, and even managed to have wet weather, in a meteorological show of sympathy. We sent a detachment of the New South Wales Mounted Police to represent us at the pageant, and Indigenous performer Gurrumul came on stage for Sing, a song written especially for the Jubilee featuring 200 artists from the Commonwealth; Kylie Minogue and Rolf Harris also performed at the concert (not together). Australia has another connection to the Queen’s Jubilee: earlier this year, the largest pink diamond ever mined in Australia was found at Rio Tinto’s Argyle mine in the north-west of Western Australia (which is the source of most of the world’s supply of pink diamonds). The diamond is 12.76 carat, and, in honour of the Diamond Jubilee, has been dubbed the Argyle Pink Jubilee diamond. It was cut and polished in Perth, and will be sold later this year; pink diamonds cost about 20 times more than equivalent white diamonds. The name Diamond is ultimately from the Greek adamas, meaning “unbreakable, invincible” (although the Greeks probably used the word to refer to other gemstones). It is from this that we get the words adamant, meaning “determined, unyielding”, and adamantine, meaning “as hard as diamond”. Diamonds are famous for their hardness, as well as their clarity and fiery white lustre. It is thought that diamonds were first recognised and mined in India, where they have been used in Hindu religious icons for thousands of years. India remained the only source of diamonds until the 18th century, when they were discovered in Brazil, and today most of the world’s diamonds are cut and polished in India. Diamonds have been used for jewellery since ancient times, and one of the most famous of their uses is for engagement rings. Medieval Italians called the diamond the “stone of reconciliation”, saying that it would maintain harmony between husband and wife. Diamonds were therefore recommended for betrothal rings, although they could only be afforded by royalty and aristocracy. It was the marketing campaign of De Beers begun in 1938 that sold us the idea that everyone needed to have a diamond engagement ring; such a campaign was necessary because of the large quantities of diamonds being brought in, especially from South Africa. Mention of Africa brings up a grim factor of the diamond industry: the blood diamonds. In politically unstable countries of central and west Africa, revolutionary groups have taken over control of diamond mines, using the proceeds to fund their operations. Processes are in place to prevent blood diamonds from entering the mainstream market, and although they aren’t perfect, your chance of actually buying a “blood diamond” from a reputable jeweller is probably fairly remote. However, the ethics of diamond mining are still pretty murky in many areas. Mines in India and South Africa not infrequently use child labour, working conditions can be cruel, and miners and gemstone cutters earn a pittance in relation to the value of the stones they help produce. De Beers have built mines in areas where they have forcefully displaced the indigenous people of the region, so even an “ethical diamond” may not be as ethical as you hoped. For some reason, the name Diamond seems to get more negative reactions than other gemstone names, like Ruby or Pearl. The very hardness and sparkle which makes real diamonds so valuable, somehow makes the name Diamond appear “cheap” or “rough”. When diamonds symbolise so many positive things – strength, beauty, eternal love – that seems a foolish distinction to make. Diamond is a gemstone name that works equally well for boys. For a start, the English surname Diamond is specifically masculine, and comes from an Anglo-Saxon personal name Dayman, meaning “man who takes care of livestock”. In Ireland, the surname is based on the personal male name Dermot, while the surname taken directly from the gemstone was adopted by some Jewish families from Eastern and Central Europe. George McDonald’s enchanting fairy tale At the Back of the North Wind has a little boy named Diamond as its hero, and the movie I Am Sam has Dakota Fanning playing a girl named Lucy Diamond Dawson, her name a direct reference to the Beatle’s song, Lucy in the Sky with Diamonds. Another connection with diamonds and royalty is a little girl named Diamond Ann Marshall, who was chosen to meet Catherine, Duchess of Cambridge on the royal tour of Canada. Diamond wrote the duchess a nice letter, and when she met her, gave her a big hug. Diamond was a cancer patient at the time, but is now in remission. Diamond’s name was given to her in honour of Princess Diana – I’m guessing Diamond Ann sounded like the name Diana to her parents. Diamond as a girl’s name has been on the US Top 1000 since 1986, and peaked at #150 in 1999. It’s currently #760 and falling. It may be on the wane in America, but I hope that the Jubilee year inspires a spike of baby Diamonds in Commonwealth countries. Looking for some more baby names for the Diamond Jubilee? Go check out these blogs from Elea at British baby Names, and Lou at Mer de Noms. I am a 13 year old Diamond and my name was chosen because I was born on my grandma Diane’s birthday and my parents were down to Kelsi Diane when someone suggested Diamond and my parents were unsure about it until my other Nana said that her grandma was named Pearl and Diamond just seemed perfect I had a gem name like my grandnana that honoured my grandma. I quite like my name and I have never met another my friends call me Mondy or Monty and some older people call me Di or mistake my name for Diana or Diane. But as a Diamond I stand out from all the Hayley’s and Lily’s and Emma’s and Emily’s and Amy’s and Nicole’s and Georgia’s of the 90’s. Welcome Diamond! I’m so happy to see an Aussie Diamond, and glad that you are following a family name tradition. Maybe you will continue it yourself by giving your daughter a gemstone name? After writing this entry, I looked up the Australian records, and there were a few Diamonds (both boys and girls) born here in the past, with a definite upsurge around the time of the previous Diamond Jubilee in 1897. Several had Diamond Jubilee as part of their name, or had Victor or Victoria. There was a Victoria Diamond Jubilee, a Victor Diamond, and a Hercules Diamond Jubilee. I also noticed the name used amongst the Aboriginal and Greek communities, and there was at least one baby Diamond from the Kimberley, so she may have been named after the local diamond mining industry. Just this week, Neil Diamond was featured in the Parade Magazine that appears in Sunday papers across the U.S. I think he just turn 70 and got married for the third time. I admit I did find Diamond as a first name a little less appealing than Ruby, Pearl, Opal, and even Amethyst. But you make a good case for the name. The meaning is great. I never realized Diamond ranked as high as #150 in the U.S. I was surprised Diamond was on the Top 1000 at all! It’s a name I’ve never run across here.